I couldn’t resist purchasing that beautiful-looking Pebble E-paper watch. It will connect to both iPhone and Android, come in a variety of colours, and have truly helpful notifications, all while lasting seven days on a single charge. That is the potential of an unseen product; we buy into the hype and hope it turns out. Well, it turns out I was not alone. Nearly 25,000 people have pledged to purchase one or more Pebbles, raising over $3.5 million for the Waterloo team. In the days since it was announced, Pebble has been made more water resistant (“You can go swimming, run in the rain with Pebble,”) and vastly more popular. When it is finally released in September, the company is looking down the road of an entire product line, and not just a single product funded through Kickstarter. We are the most funded Kickstarter project ever thanks to you! The Pebble team and I really appreciate your commitment and backing. It’s been an incredible couple of days and we’re amazed at how many people share our vision. We’re working extremely hard to produce the best Pebble we can. 1. We are trying our very best to answer your private messages. We appreciate your patience. 2. Please continue to post in the comments section! We are keenly reading all your ideas and suggestions. The product is turning out to be amazing, and you can’t blame that many people for being excited about it. 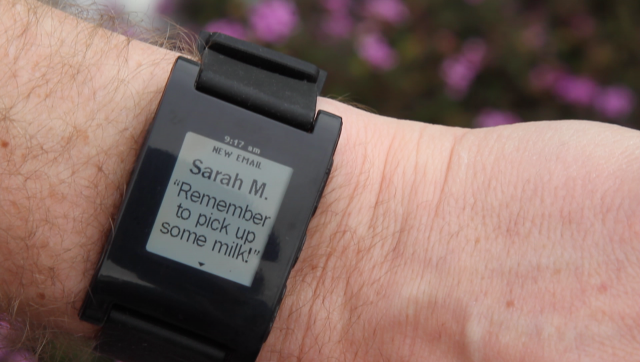 If it manages to fulfil all of its promises, Pebble could single-handedly reignite watch use for this generation.